Twiends, a free of cost service can help you grow your social network by increasing your Twitter followers beyond your imagination. 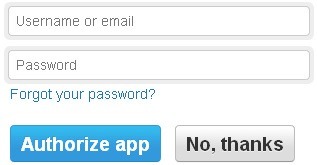 The application follows a simple rule of give and take, in terms of Twitter – follow and get followed. You just need to authorize the app with your twitter account and start following other people which can be filtered according to your interests or by your country , so that you can follow those people who share similar interests. 1. Go to Twiends. 2. Click on “ Add Your Twitter Now Free” as shown in image below. 4. 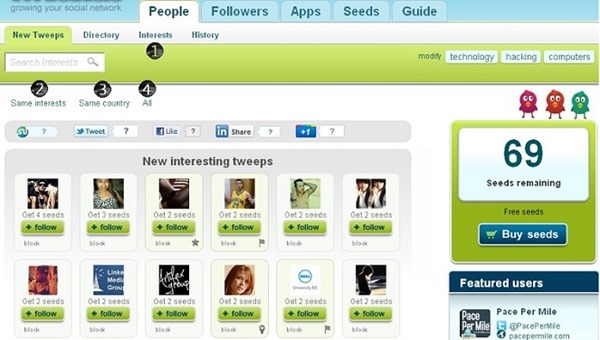 Now you have authorized the app and you will be presented some of the other people who are using Twiends to follow. Select your interests so that the app shows people who have similar interests as you. Clicking on this button will show you people with similar interests instead of showing you all the new tweeps . All will show all twiends users. Increase Facebook Followers/Subscribers, Google Plus One, YouTube Views And Much More For Free. You can follow any one and any number of people by just clicking the follow button. Now, the logic behind following someone is that you get seeds to follow somebody, or in an easy language you get credits. Seeds you get by following someone are also shown above the follow button and you should try to follow people who offer more number of seeds. And on the right side of the page you will see your total seeds remaining . The more seed you have, the more followers you are going to have because these seeds will be offered to other users to follow you. You can also Buy seeds instead of following other people to increase your follower count.